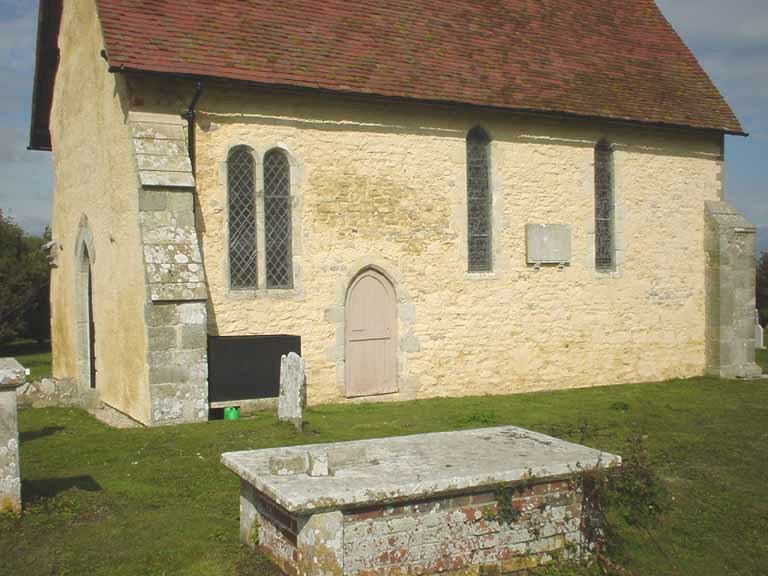 On the shores of Pagham Harbour, the Church is the 13th century Chancel of the Parish church of St Peter which was moved 1 mile south in 1864, to be near the centre of population. Under Canon Law the Chancel cannot be moved so it was sealed at the 12th century Chancel Arch. It is now in the care of 'The Churches Conservation Trust' as a redundant building, though still occasionally used for services. The site is thought to be the location of the Cathedral built by St Wilfrid after bringing Christianity to the South Saxon kingdom in AD 681. The See was later moved to Chichester. There is a curved earthwork to the south which still hides it's secrets. Various suggestions have dated it from the Armada back to the Saxons. The pink/beige tinge to the walls is a result of the traditional protective lime wash treatment given to the walls.